A 3½ month old male child presented with history of fast breathing and excessive crying for past one month. He had been treated for respiratory tract infection with congestive failure. His physical examination revealed heart rate of 122/ min, respiratory rate 36/ min. Normal first and second heart sounds. There was a grade II/VI early systolic murmur at left upper sternal border. Chest X-ray was unremarkable and ECG was normal with no evidence of ischemia. An echocardiogram revealed normal segmental analysis, with normal biventricular contractility. The left coronary artery was dilated [Figure 1]. Color Doppler examination suggested presence of multiple collaterals across the interventricular septum between right and left coronary arteries. There was a diastolic flow into the main pulmonary artery, close to the pulmonary valve. Upon further evaluation the Right Coronary artery was seen to be arising from the Pulmonary artery [Figure 2], [Figure 3] and [Figure 4]. 1. Soloff LA. Anomalous coronary arteries arising from the pulmonary artery. Am Heart J 1942;24:118-27. 2. 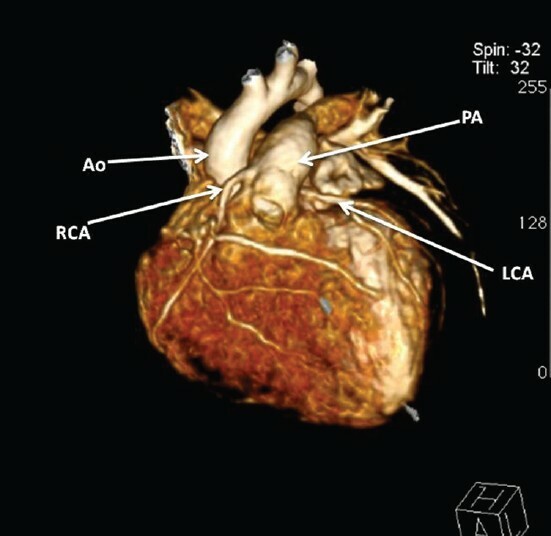 Modi H, Ariyachaipanich A, Dia M. Anomalous origin of right coronary artery from pulmonary artery and severe mitral regurgitation due to myxomatous mitral valve disease: A case report and literature review. J Invasive Cardiol 2010;22: E49-55. 3. Bansal M, Golden AB, Siwik E. Images in cardiovascular medicine. 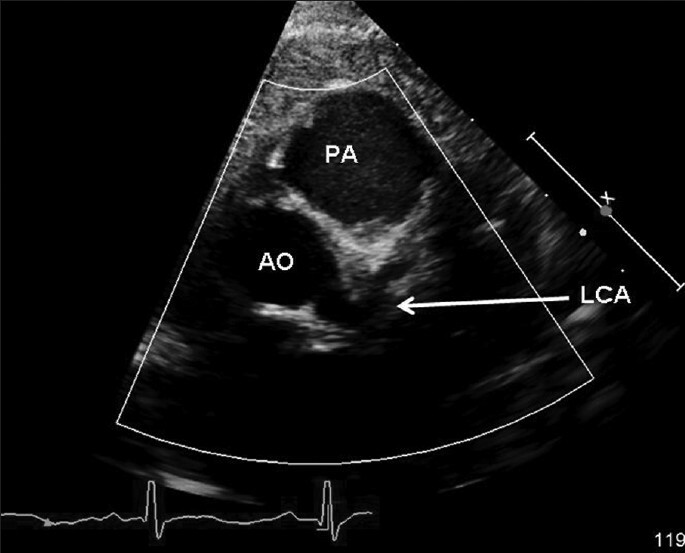 Anomalous origin of the right coronary artery from pulmonary artery with ostial stenosis. Circulation 2009;120: e282. 4. Maluf MA, Smith M, Abellan DM, Troster EJ, Takaoka F, Rati M, et al. 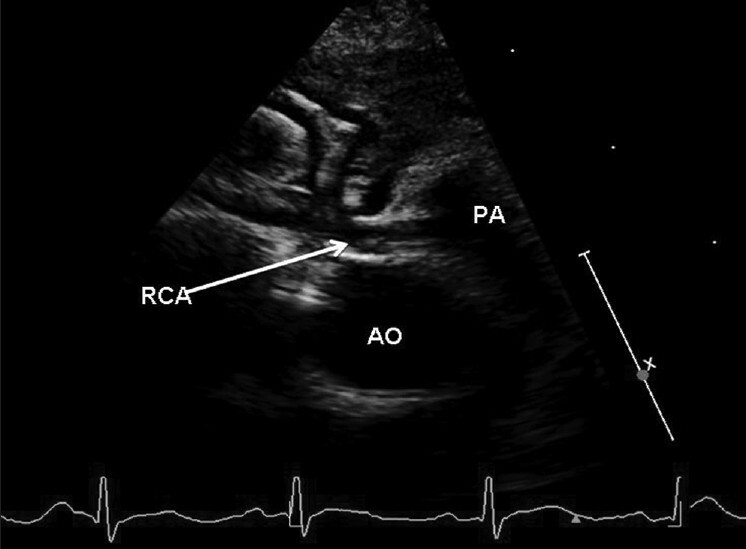 Anomalous origin of right coronary artery from the pulmonary artery in association with a ventricular septal defect. Tex Heart Inst J 1997:24:226-9. 5. Hekmat V, Rao SM, Chhabra M, Chiavarelli M, Anderson JE, Nudel DB. 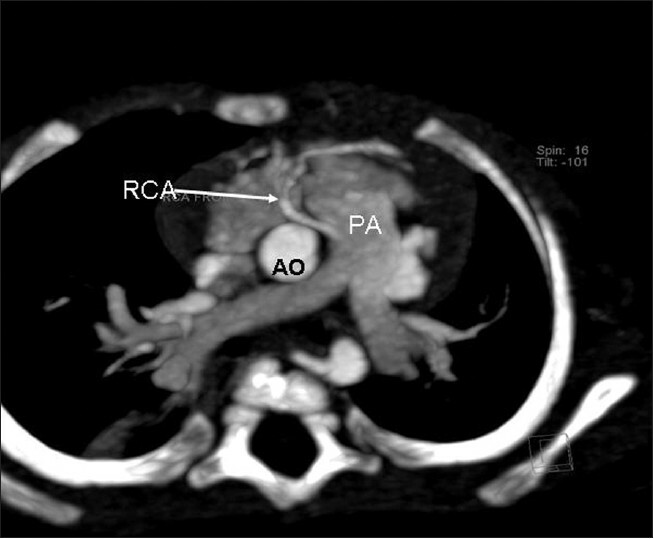 Anomalous origin of the right coronary artery from the pulmonary artery: Diagnosis and management. Clin Cardiol 1998;21:773-6.